For a family shoot we would normally recommend two hours on location. In addition there is a number of hours of post editing work to do. For this we charge $300. Makeup is additional and starts at $120 for each person. Concealing pimples etc on boys and girls is $15 each. The price covers the shoot time for all our staff, travel to location (up to 50km), and post editing. 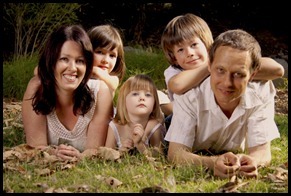 You can expect to receive roughly 10-15 fully edited images - eg at least one good photo of each person, three good group photos and maybe more depending on how much time we have to change it around, some couple shots, and some combination photos of the children. These will be supplied as digital files that will be full size images – usually 5-15MB in size. In addition we supply a DVD (or digital download) with all the OK non edited photos on it. Typically in that time frame this will be around 40-60 photos. Printing prices vary depending on what size and quality as well as what medium, eg. Glossy, Canvas etc. Contact us for pricing. The Crepin family came to us to shoot professional portrait profile pics for their resumes and LinkedIn. If you need photos like these than contact us for our great portrait pricing. We often get asked to cover a birthday party for the family, friends and guests. Sometimes we are asked to keep the images private and we are certainly able to do that. We can even create private web albums for people with access only to view. For Narelles party, we were asked to shoot and post the images to Facebook which we did. Here is the Facebook albumhttps://www.facebook.com/pg/DreamcoatPhotography/photos/?tab=album&album_id=1405820819439675. And here are some of the pics from the party at the Sandstone Point Hotel. Nicole wanted to surprise her dad on his birthday. She flew her brother down from up north and then dressed Dad and brother the same while she and her sister also matched. They came to us on a very hot day to shoot some posed formal portraits – possibly the last time the family would be together due to dads poor health. What a wonderful way to create some memories! After a lightning quick posing they were off and out to lunch together making the most of their time. Tim was very friendly! My bubba loved getting her pics taken.